Friday and Saturday nights of The Fantasticks we had really bad weather. Friday Professor B had to come on stage and tell the audience in the middle of the show that the weather was getting bad and they were free to leave if they wanted to. Then when they restarted the show the power went out and they had to wait before picking back up again. The Bantam show for the company got cancelled because of the weather and it was rescheduled for Saturday night. Of course, Saturday we ended up having a tornado warning, and the sirens went off. We stopped the show, asked the audience to stay in their seats and then we headed down to our storm shelter to wait things out. We finally restarted the show, and I the rush at the concession stand at intermission was crazy! I received a very nice compliment from a couple who had seen East of the Sun and the guy tipped me! It's so interesting to be in a place where people appreciate theatre so much, since in most of the USA it's over looked and not seen as a profession. Saturday night we did our Bantam show extra late and the company really loved it. It was great to finally have a good sized audience in the space that liked the material. We'd been playing to audiences of 12 and it was a little rough. Sunday night we had strike and change-over, meaning we take down the whole set of The Fantasticks and install the set for Girls of the Garden Club. We were out until 1:30, which was really fast. It was a huge set, and I was on deck crew, meaning I was helping put up the set instead of working lights or something else. It was a lot of fun having a hand in putting up the show. I need to get a picture of the set, it's huge and beautiful. The Scenic Designer did a fantastic job, and he was really fun to work with. Most of the plays this season are box sets, meaning they have 3 walls, boxing in the stage. So a lot of our change-overs are going to be intense. But the set designs look really cool, I think. I got put on Props Run crew for Girls of the Garden Club which is slow going since most everything is brought on by the actors themselves. We have few hand offs, but 2 big set changes that we have plenty of time for. It's a very relaxing crew and I'm finding a lot of time to work on my lines for The Effect of Gamma Rays on Man-In-The-Moon Marigolds, which is great because I had my first rehearsal today and I was very familiar with the script. I'm nearly memorized. Rehearsal was fun, and we had some great talks with the director about our characters and relationships and I'm very excited to get to work. The set design looks amazing, and we get to have a real rabbit!! Watching The Fantasticks last night really made me realize some things. Melissa was doing her thing up on stage, surrounded by 4 guest artists and holding her own. That's what this summer is here to show us. Can we do this with the professionals? Will I hold my own? Can I see myself in a year acting for money? Boji didn't really start for me, until I saw that show and realized that this is really something I can do. Those actors up there made me remember why I love this all so much. We all worked so hard to put everything together to give them a good run, and they worked hard to ensure that this theatre stays open. They were all so talented. 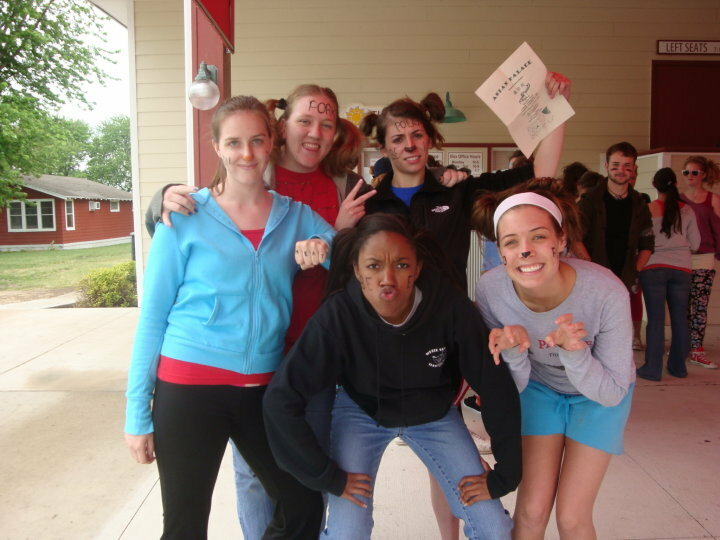 And those guest actors graduated from my school years ago, and they'll always have a place at Boji. This is a bit convoluted, but what I think I'm trying to say is that for the first time yesterday, I felt like a professional. 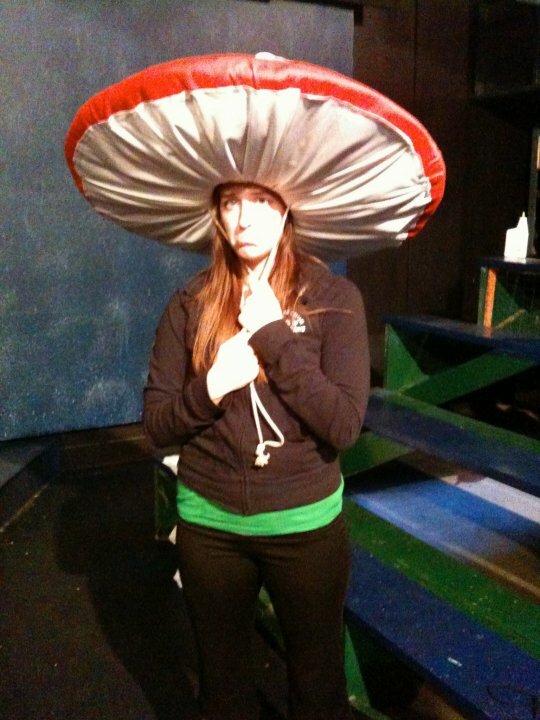 And I was so proud of Melissa up on stage, acting like a professional. And I use professional as a term of describing that she's not only incredibly talented but she also knows what she's doing. Boji isn't school. We've learned enough by now to truly apply it and make our own success. I've also been doing a lot of reading this summer to get a grasp on what I'd like to do after graduation. 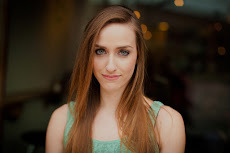 There's so many amazing theatres that offer paid acting internships, and there are quite a few repertory theatres out there to audition for before attempting to go big. I'm still interested in film, and I've been thinking a lot about moving to Dallas and working small time to build a resume first. Of course, I can't really know what I'll be doing because I'm going to have so many auditions this next year and I'll learn so many things about the business that I never knew before that will change my perspective. One of our recent grads talked to us a little last week and told us the percentage of people who make it in this business working only as actors without another side job. It's not a lot. But I think I'll have to figure that out when the time comes, and right now--I'm going to focus on Boji and work my hardest to be a professional too. Crazy Week 1 Down--2nd Week Almost Over! The above picture is from the previously mentioned Boji Olympics. This was my team: The Assorted Meats! It's been so crazy I haven't found the time to update. 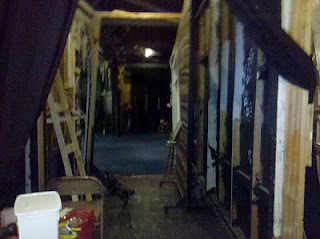 We've been working hard in the Bantam Theatre to get the show up and running. 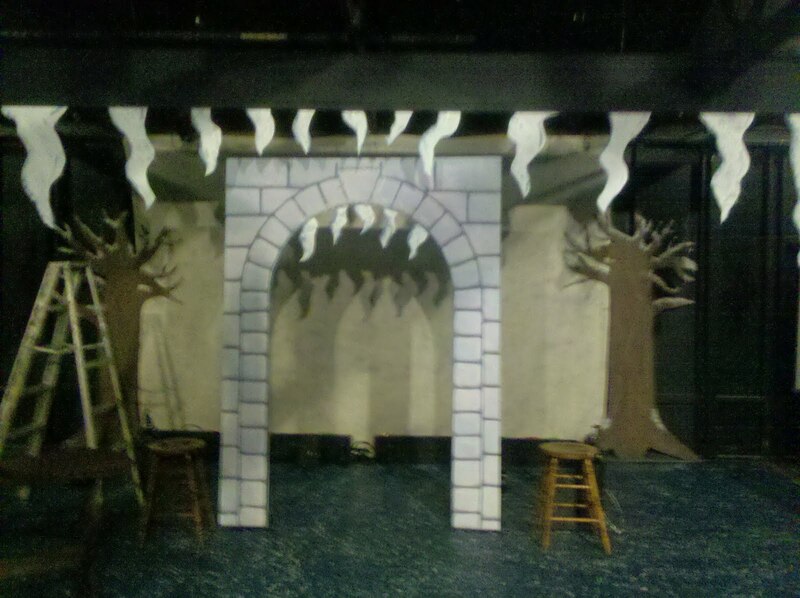 I finished up carving, painting, shading, snowifying, and hanging the icicles finally! 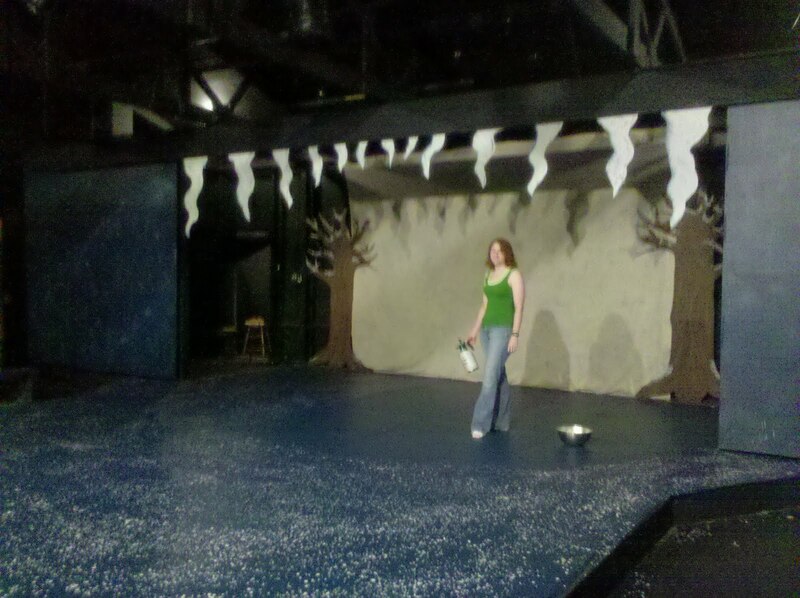 Laura, our Production Stage Manager of the Boji Bantam Children's Theatre is pictured above, doing a marvelous job of painting the stage--for the 2nd time. 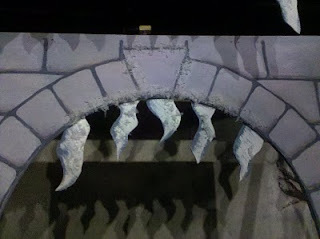 The second picture of icicles is on the 'castle arch' used for the Ice Witch scenes. We quickly discovered that, while the adhesive used to put 'snow' on the icicles is incredibly strong, it will continue to snow on stage. So I did some touch ups, to re-snowify things before we opened on Wednesday. Our rehearsals went really well. We spent a lot of time going over the first and last scenes. The first scene is hard for me because I have to dress one of my castmates, and we'd been practicing so long without the costumes that by the time we had them it started tripping up our lines. The last scene is so long and so many of the lines are similar that the cast was having a hard time memorizing it. I hardly have any lines in that scene, so it was easy enough for me. We definitely changed some things in the last couple days of rehearsal. I worked on finding a new 'hag dance', which has become a mixture of gestalts and performance art that I do when chanting a song in the show. We also created tunes for the song I have to sing: Twinkle Twinkle Little Star. I know, we're incredibly creative. We worked on speaking Trollese, picking up the pace to get the time down, and we even spent a couple nights installing lights. Of course, we didn't actually get to use them until opening night. We had one last rehearsal Tuesday morning and then we were required to go to shop to help set up everything for the opening night of the mainstage show The Fantasticks. I went to shop and built a flat to be used at the Press Party held every year on opening night after the show. After building everything, we majorly cleaned up the show, and then decorated it, because that's where we have the party. We built a stage for the band that comes and we put up stage lighting, a bar, and put some color in the room. Then we had company clean up where everyone helped clean up the inside and outside of the main theatre for the show that night. Then we had a little time to eat and then play musical showers to get ready to crew the show. Everyone not in the show is required to work a crew. Each actor will get one week off the whole summer, so most of us were working this week's show. I worked concessions, as I will for the duration of this show. I can eventually work as an usher, box office person, House Manager, Concessions Manager, or as a run crew person doing lights, sound, or backstage work. We all dressed accordingly and put on our awesome new name tags and marched out to the awning to greet the patrons. I had a great first night at concessions. It took a little long to clean up after intermission because it was the first night. Then we raced back in to really dress up for the press party. By the time I made it to the shop everything was in full swing. The patrons sat in chairs and at tables and watched us dance. The band was really great and we were having tons of fun. Unfortunately the weather got so bad that Professor B had to come tell the band and the patrons that they had to pack it up for their safety. It was about 4 hours earlier than it normally would have ended, I think. But they had a great last song in honor of Professor L, who directed The Fantasticks. It was obviously an age old tradition, because all of the guys came out and danced with her, which was hilarious. It started pouring after we cleaned everything up so we all ran to hang out under the awning. I danced in the rain a bit and then went inside to change. Tyler, our resident lawn mower, ran into a clothes line (yes, we're old fashioned here) and ended up giving himself a really bad cut on his forehead and a black eye that ended up keeping us busy for a couple hours to round off the excitement of the night. I woke up Wednesday morning ready to perform. Of course, I had to watch as much of the US World Cup game as I could. The show went well, all things considering. We covered up any mishaps, not that there were many. We had a good sized audience of about 50 kids. The lights were the only major flaw. There were some random dark spots, and scenes where there were only back lights. Those were definitely fixed by today, and we had a great show! We had 12 people show up, so it was a slow day, but it was interesting to play to such a different audience. Definitely a challenge. 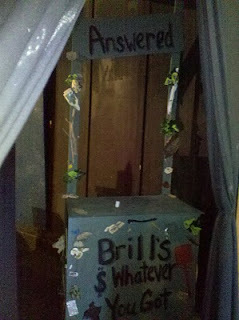 I've been in prop shop in the afternoons building things, finding things, and tearing things apart. It's been fun and really relaxing. We work the show at night. I watched the show tonight and it was absolutely phenomenal. 3 rehearsals today and 3 tomorrow as well. I think I'm finally getting the hang of it. By now I can't even imagine having 4 weeks to complete a show. We were supposed to have 2 weeks to rehearse East of the Sun and now I can't even imagine having more than the week that we have. Rehearsals have been going well. We'll be off book by tomorrow but we're basically off book anyway. We'll be starting our straight run throughs today. Yesterday we tried a run through with costumes, but the Bantam theatre was so unbelievably hot that plus the layers of costume that we had, we were sweating buckets. Director A let us go. David Bowie is almost complete, the icicles are almost ready to be hung. All set pieces have snow on them now, which was fun, and the hag stands are currently the best looking stands ever made! Seriously, they're everyone's favorite pieces. I'll get pictures soon! I even got to do some sewing today for David Bowie's clothes. I taped out the section of the bleachers (The Bantam theatre used to be an outdoors theatre, and the original seating is still in place, so yes--we have bleachers) the some of the actors need to use so our audience doesn't sit there. I also swept underneath the bleachers. It was gross. I've been putting the theatre company's YMCA membership to good use and have been excercising with Kaitie every morning...for 2 days now. They have a very nice facility, and it's only 2 minutes away. Occasionally I even get time to watch some World Cup these days! Whenever we have rehearsal breaks, a couple of us usually run for the TV to see what game is on and we try to catch up on the highlights. I saw some of the US game today, it was looking really grim when I left, but I was excited to discover they evened out the score with Slovenia to 2-2!! I'll definitely have to find and watch the rest of that game. I've got rehearsal to get to! David Bowie is our troll puppet for East of the Sun. He's a great looking troll, very similar to a Hun from Mulan. I made his beard today, and it's pretty cool. I'll take a picture and post it sometime. Rehearsals have been going really well. We worked shop yesterday morning and this morning, and we're almost finished with everything! 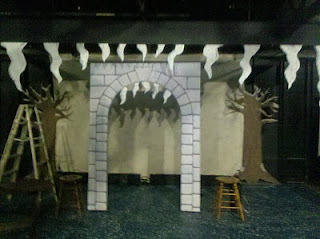 We just have to hang our icicles because the play takes place in the arctic. Yesterday we started blocking and got half way through Act II. It was a little rough because I hadn't completely decided on my character voices and physicality yet, but it was coming along. Today we finished up the play and I'm pretty set on my characters. 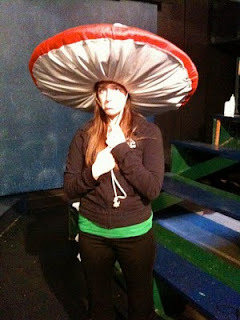 We're going to start our 'intense work-throughs' as our Stage manager Laura calls them. We ended rehearsal today by working the first part of scene 1 multiple times, and it still isn't done. We have so much time, I think we'll be incredibly prepared for Wednesday. It's hard to believe that people can take so much time to put up shows when you don't really need that much time. Then again, at school we have rehearsal from 3:30-5:30 and then 7-10. Here we have rehearsal from 10-1, 2-6, and then 7-9 or 10. So...I suppose it's just more in one day. And it's incredibly exhausting. We get one ten minute break in the morning and evening shift and sometimes 2 in the afternoon shift, usually just 1. It's fun, but it's also eye opening. Theatre isn't a hobby or a degree here, it's a job and it's pretty fun to finally get to treat it like a career choice. Everyone here is really serious about there work. We're all almost off book already (memorized). We got out a little early last night, at 9 and so Katie Mac and I went out exploring Boji/Spirit Lake. We road our bikes to the YMCA, and then we came back and took a drive around town. There really isn't much around except antique malls. But Katie found a quilt shop she wants to visit. I think we're going to have to go back towards Spencer to find anything to do, which they told us we would. So that's our next adventure coming up! We also went out to Betsy (a nearby firepit that we have free reign over because the next door art center 'accidently' built it and their parking lot on our property) last night with the whole class. It was fun to finally have some time to breathe. It's been so non-stop. It's easier to get stressed out here than I thought it would be if you don't make time for yourself. Tonight is Sausage and Hotdog night, and we had meatloaf for lunch. Things are going pretty well. I'll feel even better when I sleep! I blogged earlier today, but I felt the need to write about my first real day at Boji. Breakfast was at 8:30 like always, and then rehearsal started at 10 am. We spent our morning rehearsal building our set, since we don't have a shop crew assigned to the Bantam theatre we're responsible for getting everything done in time to open on Tuesday. Since it's also the first Bantam show of the season, we had a couple extra jobs to get done, such as making a new sign to put out front. I spent the morning using the jigsaw to make small, medium, and large icecicles that will hang from the ceiling and frame the stage. Alex did most of the dirty work, putting our set pieces on casters, so we can wheel them on and off stage easily. Afternoon rehearsal was a read through, character discussion, and then we put it on its feet, but we gave the play our own blocking. Director A really wanted to see our physicality and the way we thought we might move. She also gave us characters from movies that she wants us to base our characters off of. Bartok from Anastasia was my main one, though I'm also supposed to watch the movie Labrynth. Night rehearsal was semi-cancelled because the designers for the mainstage show aren't all here, so the shops were having a hard time being productive. So all night shops were cancelled and we were encouraged to not rehearse. However, we decided to have fun and watch some of the movies that Director A referred us too. We watched Anastasia for me and The Princess and the Frog for Nicole. We talked over some of the character expectations for us. I'm going to work on taking Bartok's vocal awkwardness and unassuming nature plus his hunched stature. Director A really wants him to be the most likeable character. We have to be careful not to get low energy ever becuase the pace of the show is like banter, and if we slow down we'll lose the audience. The next week should be a lot of fun developing the show! After a 13 hour drive to school and then a 9 hour drive to Boji on Friday with Gillian and Lauren, we unpacked our bags and settled in to the dorm. It's beautiful here. We have a small lot housing cabins, trailers,houses, our dorm and two theatres. There's a volley ball pit in the back and I played with the pre-season and staff on Friday night. We had a meeting with the company Friday night welcoming us to Boji and explaining some things about the lot, the dorms, and the ground rules. There are 3 meals a day at specific times: 8:30, 1:00, and 6:00. The entire company and staff line up in the green room and you have 20 minutes to pick your food and eat it from the small table in the kitchen. It's some of the best food I've ever eaten. It all tastes amazing! Our chef is extremely talented and I can tell already I'll miss the food when I leave. After 20 minutes all of the food is taken away and you're expected to move onto your next job. They do it this way because one of the crews we're all assigned to is clean-up crew. So we have to have time to clean up the kitchen and wash the dishes and put away all the food before rehearsals and shop starts at 10 every morning. It took a little getting used to, but it's kind of nice. We aren't allowed to waste any food, because the budget is so tight (lets face it, it's summer theatre, there isn't one with a good budget out there)so you get smaller portions to make sure you don't waste anything and you don't usually go back for more because there isn't much time. All of the staff have their own housing (some of them have their own houses on the lot). And the young staff also has their own separate housing. The next renovation for the lot (they redid the theatre a couple years ago) is redoing the student dorms. It will be nice, but I have to say it will be sad. These have been around since the beginning and it's kind of cool to be a part of the history, even if that includes splitting two showers between 20 girls. Saturday morning everyone cast in a children's show (Bantam, as I'll refer to it) had auditions to be placed as specific characters. My Bantam show is East of the Sun and I auditioned for Poppa, Hob, and Snowdrop. I got cast as Hob(the non-human assistant of the Ice Witch), Brill (an old hag), and a sister who gets to use puppets. 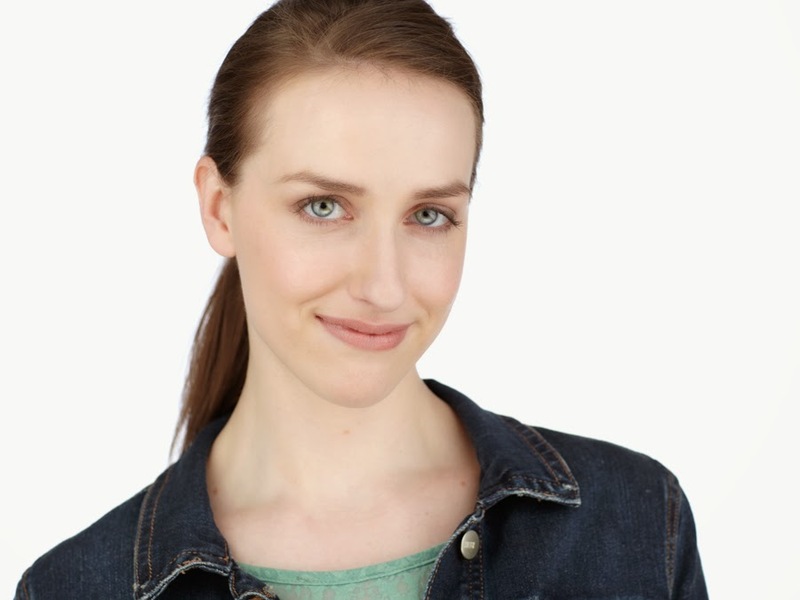 Our Bantam director A is getting her MFA in Directing Youth Theatre and she has a thing for making puppets. 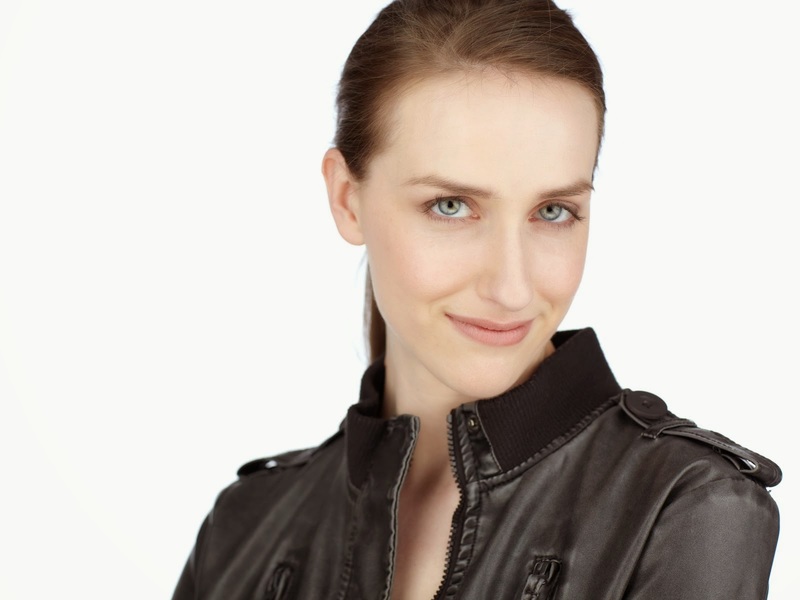 I'm extremely excited about getting to use puppets in her show. All of the shows have puppets and it's looking like Fantastic Mr. Fox will be the coolest with full size puppets that stand on the actors legs! I actually start rehearsal today for East of the Sun, all day. Everyone else (not in the mainstage Fantasticks) has shop to hurry and build the set for the mainstage show by Tuesday when it opens. Gotta love doing 13 shows in 10 weeks! After auditions we had orientation all day. We got a tour of the lot including staff housing, lights/sound, theatre, hog house(secondary rehearsal space, was a hog house at one point but that building was torn down, and this replaced it), costume shop, prop barn, box office, Public Relations, and scene shop. There was a history lesson about the Okoboji Theatre (we're now in our 53rd season, performing in what used to be an airplane hangar) and about many of the buildings. The theatre had a recent remodel a couple of years ago which gave us a new rehearsal hall, and a nice tunnel to store things in. 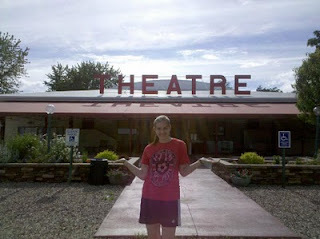 From what we were told this theatre used to be an airplane hangar, surrounded by a lot of farm land. A college in Des Moines (Grinell) decided to purchase the hangar in 1953 when the regional airport moved to a new location. The theatre company used it for a year or 2 but without much success. However, the city of Okoboji loved the idea of having a summer theatre so much that when Grinell wanted to give up the building, they looked for a new buyer who wanted to continue the theatre. Bill West heard about it from a friend and decided it would be the perfect thing to help expand my college's theatre department. So in 1957 the Okoboji Summer Theatre Association, after repeatedly trying to sell the theatre to my college (who didn't want all the acres that came along with it and refused to purchase it even when the association lowered the acreage), raised the money to buy the theatre themsevles and then gave it to my school as a gift. 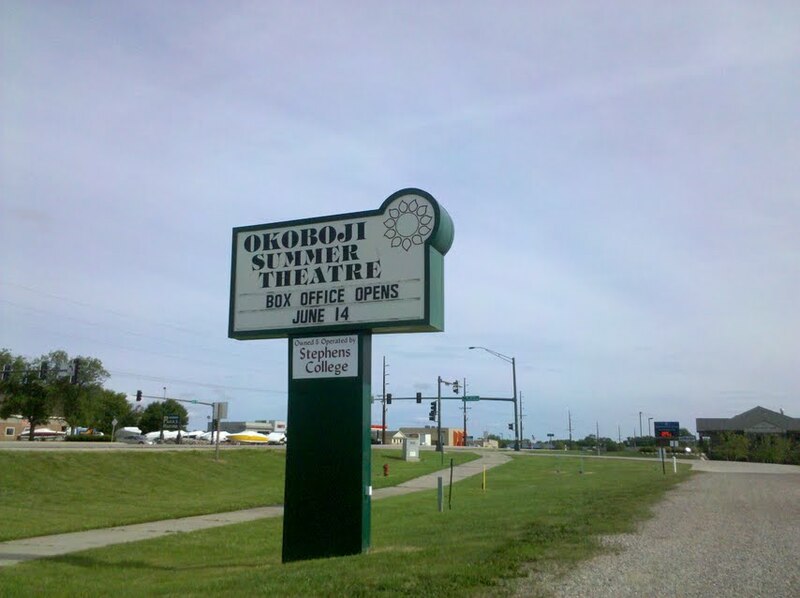 So Since 1957, the Okoboji Summer Theatre has been up and running, producing 13 shows in 10 weeks every summer. They say after just one show the people of the town will recognize us and give us their opinions on our performances. The box office opens today and there is already a line of senior citizens in their patio chairs lined up under the awning! This summer will be one amazing experience. We had a large bonfire (something that will happen a lot while I'm here, and they say sometimes the community thinks it's ok to join us...) on Saturday night. They brought out some great lighting and sound equipment to the slab (our make shift concrete dance floor in the middle of a grassy field that is actually used to paint the flats and floors for every show) and we danced for a couple of hours and mingled with the staff. Sunday we still had a little bit of orientation to finish up and then we had lunch and an hour before the Tech Olympics. This is a Boji tradition to kick off the season. The staff runs a torch around the lot (or in Prof L's case, they get to ride on the back of a truck :) ) and then the games begin. I was on overload from everything we had learned in orientation, and they had handed out study sheets but not much more could fit inside my head. While perusing a Chinese menu my team decided that we would be called the Assorted Meats! So I was Duck, and the we had Polar Bear, Pork, Beef, and Tofu. We split up to compete against the members of other teams by running around the lot. We had to do a timed test in each area: scene shop (we had to build a screw box, I wasn't very good at it), costume shop (we took a quiz and sewed on a label), prop barn (we solved riddles and found props to match them), lights and sound (we hung a light, striked a light, and put together a headset), box office (we filled out a long card to reserve a seat, I did it wrong), and then a break. We next went to the Bantam theatre and played Public Relations Jeopardy, which I thought my team did amazing on, but we still didn't win. I also broke both of my buzzing noise makers before the game was through. It was a lot of fun, but a little stressful. Then we played team volley ball! Unfortunately my team was not so well versed in the technique of hitting a ball over a net so we were soon watching from the side lines as another team won. All in all it was a fun day, but a little bit too much of a competition. I was ready to move onto rehearsal. Orientation has been so full of information that I was having a hard time enjoying myself yet. But the Tony party we had was really fun, and now I'm ready to move onto rehearsal! I have rehearsal morning, afternoon and evening. The next mainstage show starts rehearsal Wednesday and they still have night shop, so I suppose that's more like what my schedule will be like once I'm done with this children's show. Actually, I'll be in shop all day for a week or two first before my next show starts. But I'm opening on next Wednesday and there's a lot of fun to be had before then! I'm off to rehearsal!